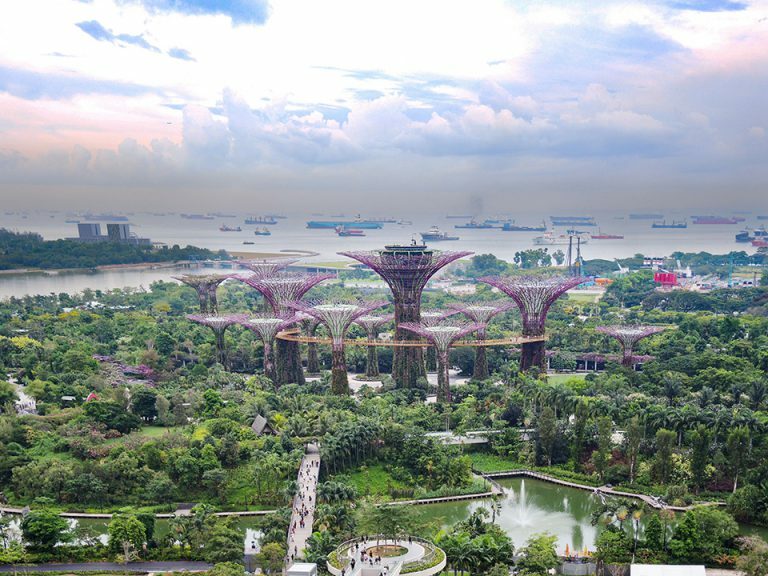 Travel Report: 8 days in Singapore. Recommendations and Tipps for Photographers and Traveller. Local currency: Singapore dollars, but US dollars are also accepted. If possible, take small USD bills for tipping. Money can easily be withdrawn at any ATM. Otherwise, credit card payment works smoothly everywhere. Vaccinations: Coming from Germany, no vaccinations are required. However, the standard vaccinations are recommended, see suggestions Foreign Office. What do we have to take? As always “onion-based-principle” of layered functional clothing and good sneakers. Singapore is very warm in our “winter” and humid even at night. Partly it can also rain heavily, so take an umbrella or at least a really rainproof jacket. In the malls and the subway, it can get very cold due to the air conditioning. All together in a Lowepro Runner 450 (Backpack). 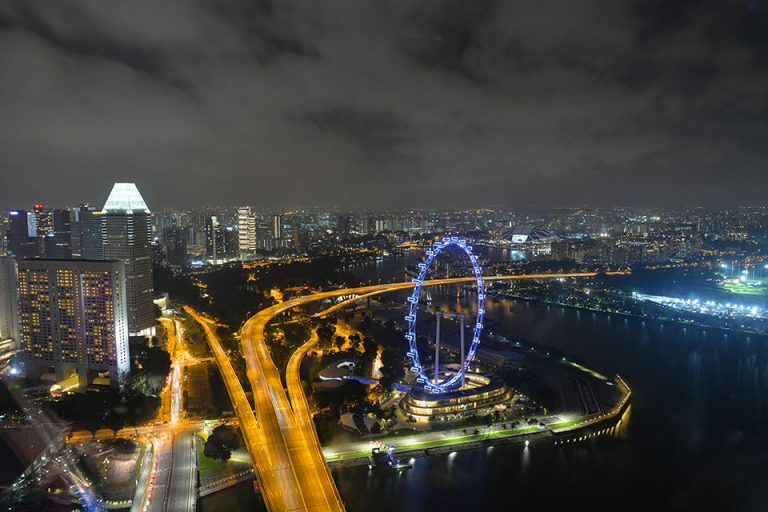 Singapore is always worth a visit and offers photographers – especially at night – spectacular motifs. From Frankfurt or Munich to Singapore is a good 12h flight and arrived in Singapore you meet very warm temperatures, often coupled with high humidity, which means that the photo equipment first “wet fogs”. From the airport to the city you have different options. Cheap and fast is the subway, taxi is more comfortable and you can see something of the city. The taxi costs about 20 euros, subway about 2 euros per person. 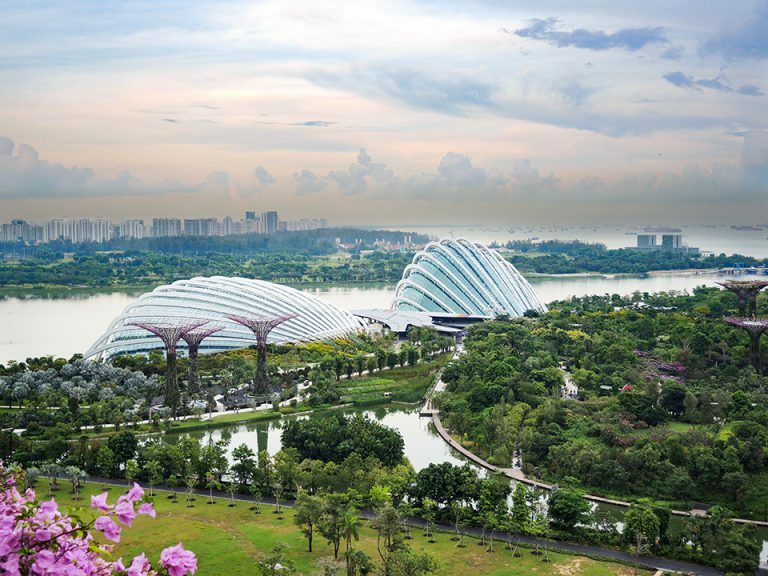 Singapore has a variety of top hotels. For photographers, it should be one near Marina Bay. Top hotels include Marina Bay Sands, Mandarin Oriental, Ritz, Swisshotel The Stamford and JW Marriott South Beach. All with spectacular views of the marina. We stayed at the JW Marriott South Beach, which is recommended in every way. 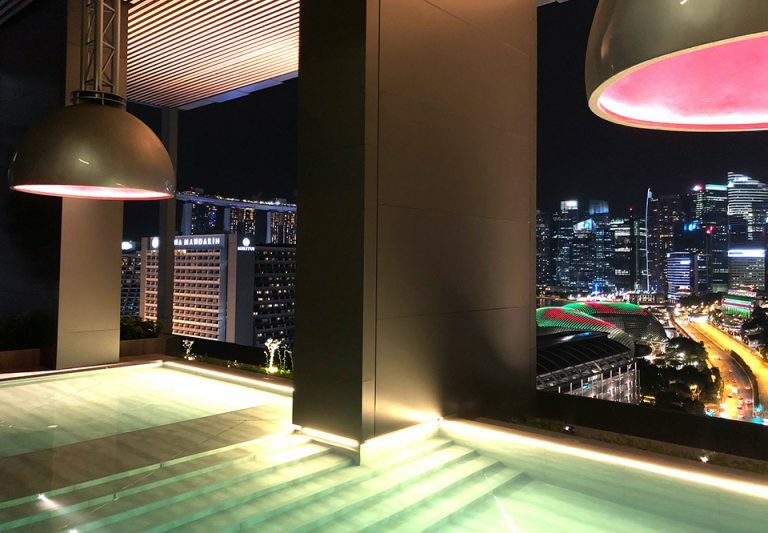 With one of the infinity pools on the 18th floor and a fantastic view over the city, you can not go wrong with the JW Marriott and the staff is extremely accommodating and helpful. First we went to the Gardens by the Bay. The oversized “greenhouses” are spectacular in themselves and at the same time a nice cooling off against the tropical 32 degrees outside temperature. From the Gardens by the Bay you can easily visit the Supertree Grove , the artificial steel trees, which in the night shine in different colors. Tip: On the the biggest supertree there is a bar. Especially at night and if weather is good it is worth a visit. 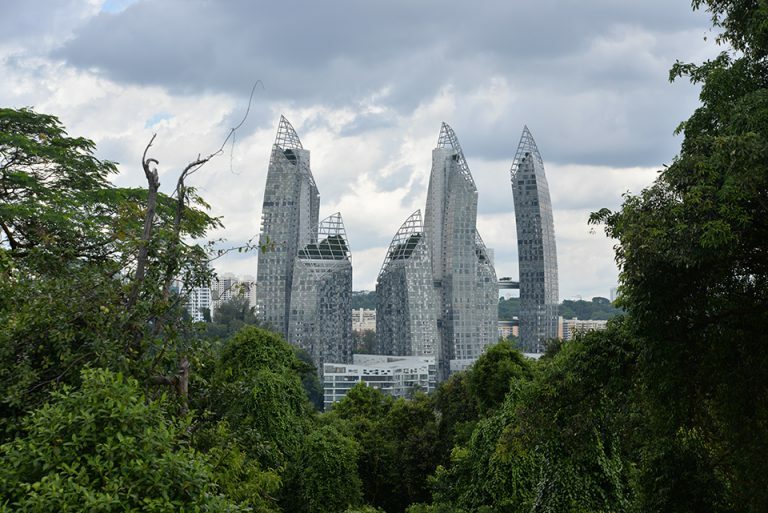 From there you can walk to the Marina Bay Sands Hotel, Singapore’s landmark. This hotel is impressive in every way from the outside and a highlight for photographers. Inside, it’s more of a station hall and everything overpriced. For those who want to use the hotel’s infinity pool, there is no other way than an overnight stay as it is exclusive to hotel guests. The connected shopping mall can easily keep up with any consumer temple in the US or Dubai and in turn invites you to cool down when it’s too hot outside. Photographically, you should have a bright wide-angle, i.e. the Nikon 20mm f/1.8. The Nikon 24-85mm travel zoom is another option. If you want to get to know the country and its people, you should do what the locals do. Eating in one of the hawker markets. 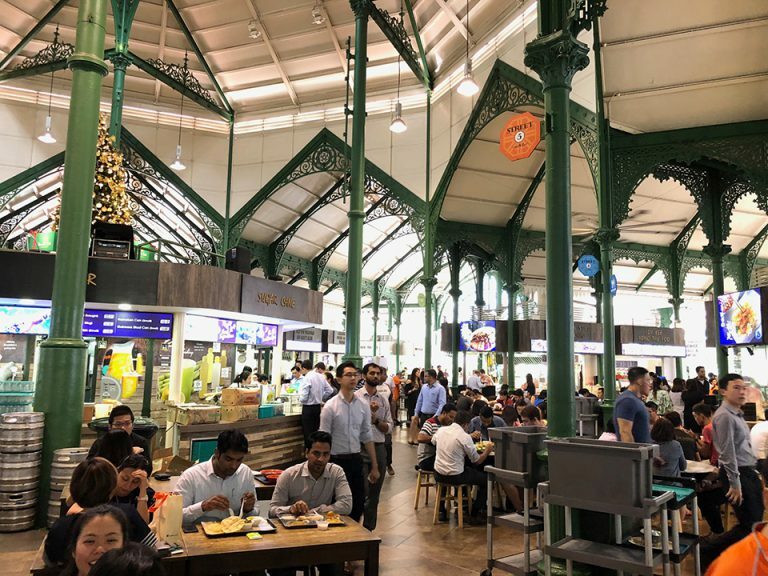 Probably the most famous in Singapore is Lau Pa Sat. The food is excellent and unless you go there at noon during the week, you will find a spot without a hitch. 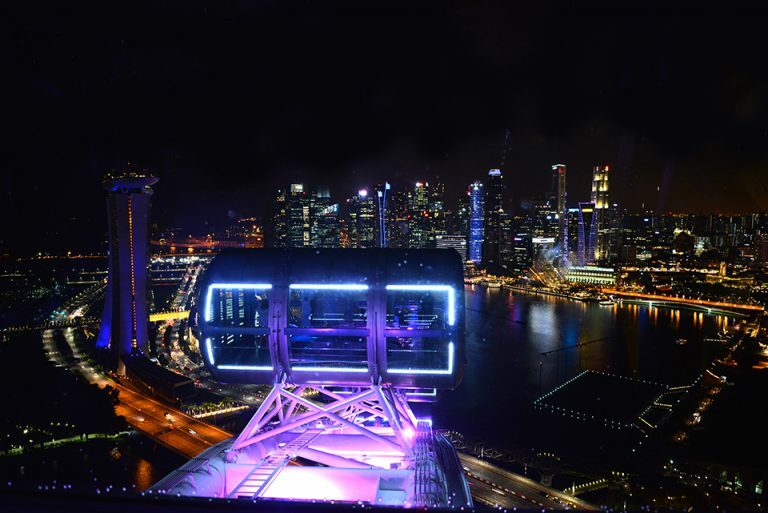 Another highlight for photographers is the Singapore Flyer, which is the world’s second highest Ferris wheel at 165m height. Definitely take a tripod, if you want to take pictures in the night. The view of the city is spectacular and comforts over the nearly 20 Euro entrance fee. Also, even if you do not believe it, the 30 minute tour is a real highlight and offers countless photo opportunities. 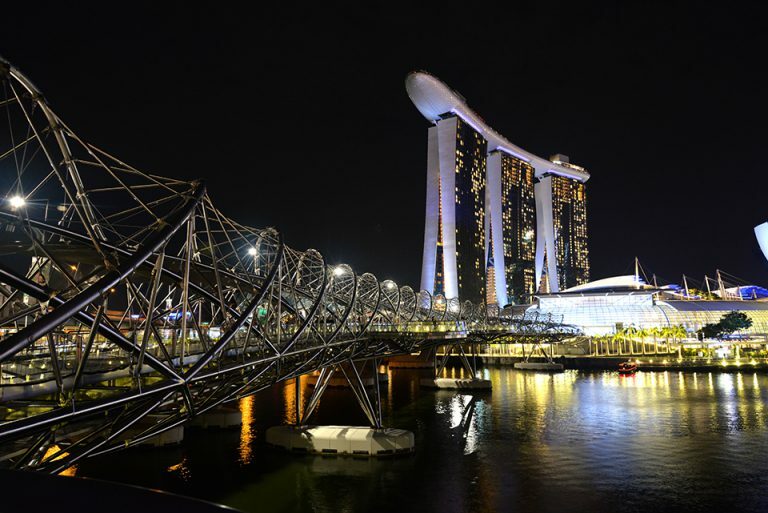 From there you can easily walk back to Marina Bay and still take great night shots of Singapore at the Esplanade shopping center on the water side. The next photo stop is Sentosa Island – the pleasure island of Singapore. From the city center just 7km away (taxi or bus) you can reach the cable car station, with which you can float to the island and from where you can take great photos again. Unfortunately the gondolas are not air-conditioned and when they are full, it gets really warm and stuffy. The best way is to get the ticket for both gondola rides at once and drive first to the island. On the island is also Fort Siloso from the 2nd World War, to which there is a nearly 37m high bridge way. 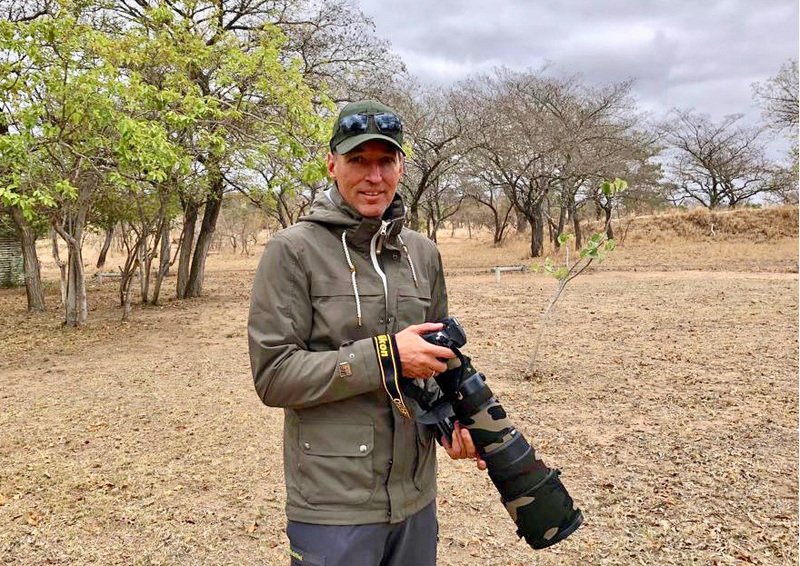 A highlight for many “Birder” are some only occurring here rare bird species, which is why you see many Asians with huge telephoto lenses. On the way back from the island you can again enjoy the great view and then drive over to the last stop. There you can visit a park and then walk for about 20 minutes through the rainforest to the valley station. Botanical Garden in Singapore. , even if you do not believe it, but there are real wildlife in the middle of the city and we do not talk about the zoo. 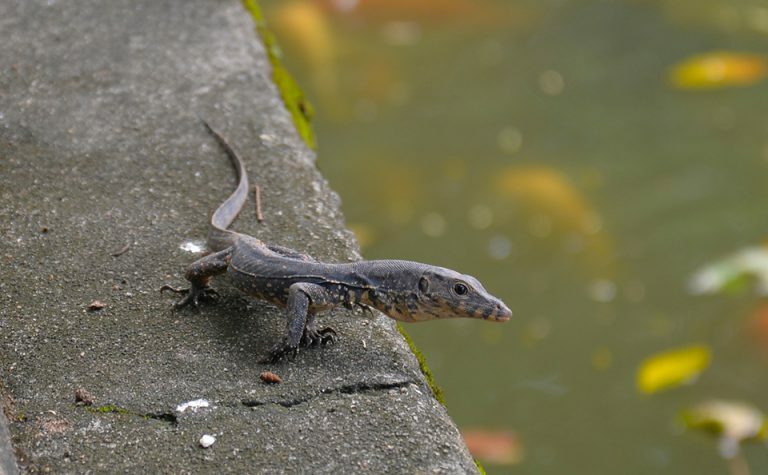 Many different species of birds, but especially turtles in masses, Lizzards up to 1.5m in length and also snakes, like the Spittting Cobra, which one rather does not like to meet. In addition, there is of course the orchid garden for plant lovers, but in contrast to the free botanical garden costs money (the equivalent of 2 euros p.P.). You can easily spend half a day in the gardens and many places invite you to linger before returning to the city. Another photo highlight is the visit to the roof terrace of the Marina Bay Sands Hotel. With 15 euros entrance fee not cheap, but you get a view from almost 200m height. Please keep in mind that the wind can be very cool despite warm 25-30 degrees to this altitude. 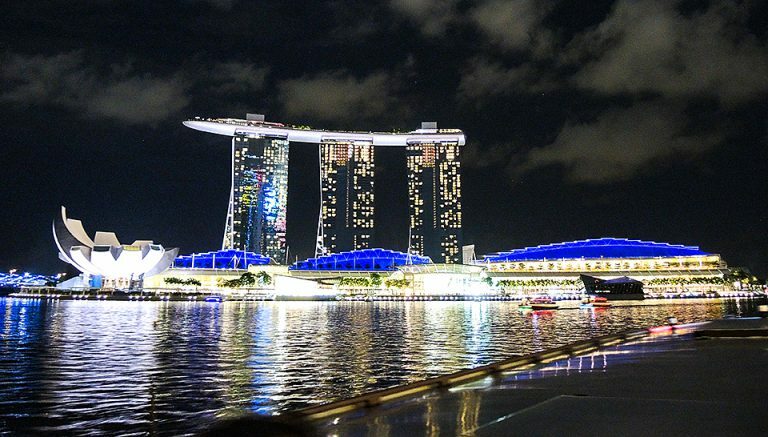 From Marina Bay Sands you can explore another photo highlight by boat, the Singapore Canal. 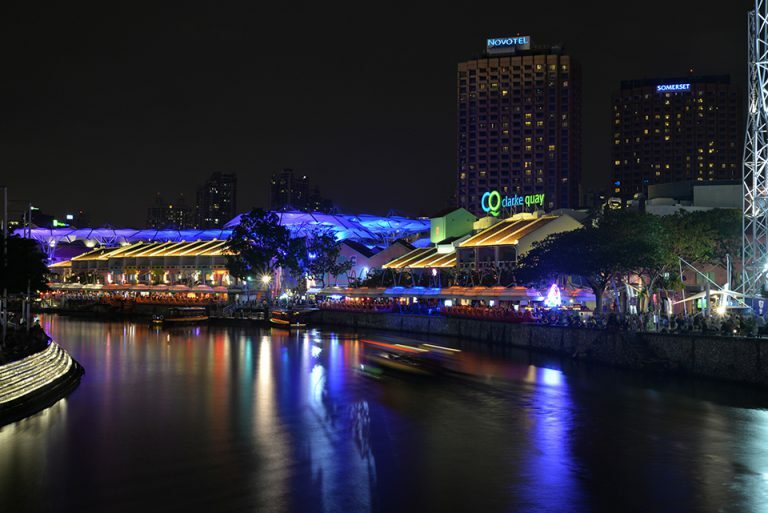 Past the Fullerton Bay Hotel and down to the Clarke Quay, a highlight for night photography. Afterwards one can strengthen oneself in the Jumbo Seafood, if one gets a place. Chili crab is a must here. 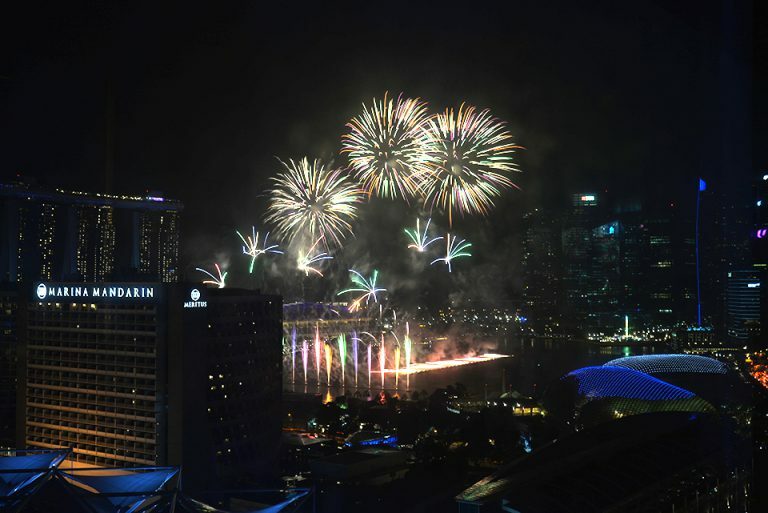 If you have the opportunity, you should spend New Year’s Eve in Singapore. Photographically a final highlight, but also an amazingly great experience. Everywhere great events and a very nice atmosphere.